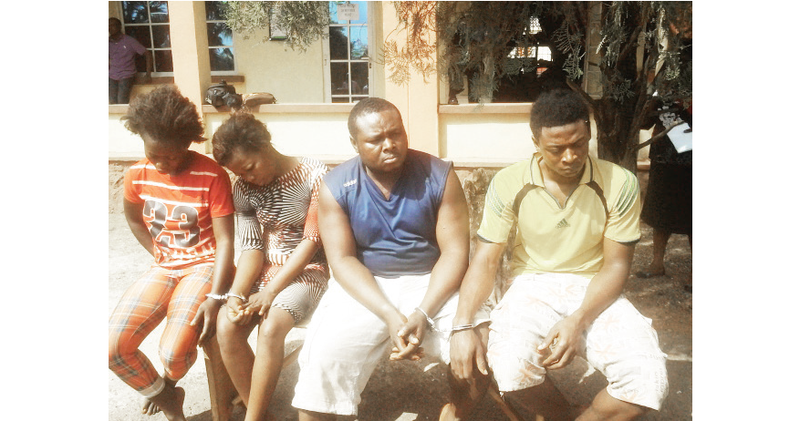 The 4 suspected kidnappers of a four-year-old-boy, Steve Kanu, in Abeokuta have confessed that a ransom of N1m was paid to them before he was rescued. Steve was kidnapped at his parents’ home at Laderin Estate, Abeokuta, on Monday, November 2, 2015. He was, however, rescued alive last Friday by the men of the Ogun State Police Command, who swooped on the kidnappers at Nsukka, Enugu State, and rescued the boy alive. Dr. and Mrs. Mucipay Kanu, beamed with smile when they appeared with their son at the state police command headquarters, Eleweran, on Monday. The suspects arrested for the crime were also paraded by the Commissioner of Police, Abdulmajid Ali. 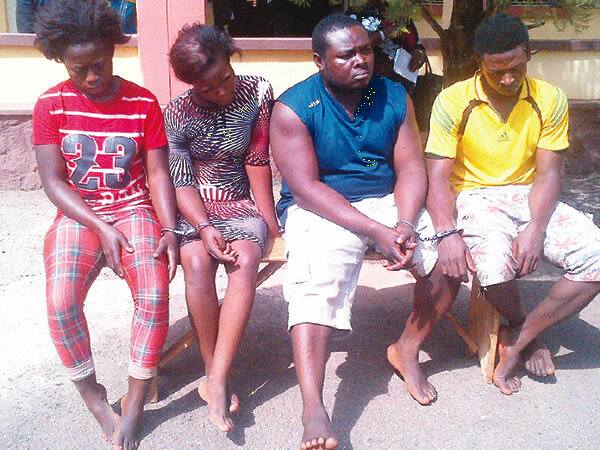 The suspects are Kenechukwu Amoke (21), Anayo Amoke (35), Oluchi Asadu (20) and Maureen Uchenna (25). Maureen, who was a staff nurse in Dr. Mucipay Kanu’s hospital in Abeokuta for over three years before she resigned in July this year, was said to have planned the abduction of Steve with her boyfriend, Obinna Amoke, who is currently on the run. The nurse said she regretted being part of the kidnapping. She said, “I learnt that Doctor paid N1m ransom to one of our members in Abeokuta before the police detectives arrested us in Enugu. ALL THESE KIDNIPPING CASE THERE IS AN INSIDER .GOD PLS HELP US . SHE’S JUST GIVING FOOLISH EXCUSES ,YOU ALL WILL DIE IN PRISON,LAZY DEVIL PEOPLE. Can anyone draw a corrolation between the men and women of the East that, they all have the same crminal tendencies running through their blood. The men of the East will do just about everything unthinkable to make money, including the selling of their kidney which is now the norm in the Asian countries.? If a woman could accept criminality as a foundation to getting her married by a man, then; the East must work at the orientation of their youth who are into all manner of crimes everywhere. And the West and north are land angels? No wonder Nigeria is a paradise they have been ruling since independent, ewu logo a.
Nigeria is fast becoming a jungle….a land flowing with milk and honey turning into a deserted land…shame. There is no marriage or husband issue between these two any where. They are members of the same gang period. May they wrought in jail for their crime. @Saudik thank you jare, leave them, the truth hurts.